Aquatic sports come second only to track and field in terms of the number of Olympic medals up for grabs. The four disciplines - swimming, diving, waterpolo and synchronised swimming - have 46 events between them, the vast majority of which are in swimming. It is difficult to find an Olympic sport that has undergone such a dramatic change as swimming. What is now one of the glamour events of the Games takes place in 50-metre, temperature-controlled pools with lane makers designed to reduce turbulence and wave-killing gutters. But conditions at early Olympiads were as a conducive to setting fast times. Venues included the Bay of Zea (1896), River Seine (1900) and a 100m pool constructed inside the athletics track (1908) and some of the events were even more bizarre - the 100m race for Greek sailors (1896), underwater and obstacle races (1900), and plunge for distance (1908). 50m, 100m, 200m, 400m and 10,000m freestyle for men and women. 100m and 200m butterfly for men and women. 100m and 200m backstroke for men and women. 200m and 400m individual medley for men and women. 4 x 100m and 4 x 200m freestyle relay for men and women. 4 x 100m medley relay for men and women. A maximum of eight swimmers contest each race and preliminary heats in the 50m, 100m and 200m races lead to semi-finals and finals based on the fastest times. In events covering 400m or more and relays, the eight fastest finishers in the heats go straight to the finals. Diving is one of the most exhilarating sports at the Games, with platform divers hitting the water at about 55 kilometres an hour. It was introduced to the Olympics in 1904 and the programme did not change between 1924 and 1996. Synchronised diving for pairs was introduced at Sydney in 2000 and there are now eight events, with the traditional 10m platform and 3m springboard diving for men and women repeated in synchronised diving. Competitors make a series of dives combining somersaults, pikes, tucks and twists and judges mark out of 10, taking approach, take-off, execution and entry into the water into consideration. Points are adjusted depending on the degree of difficulty, based on the type and number of manoeuvres attempted. Synchronised diving is also judged on how the pairs mirror height, distance from the springboard or platform, speed of rotation and entry into the water. 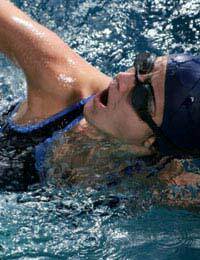 Waterpolo players need the endurance to get through four seven-minute quarters of a match without touching the bottom or side of the pool, and can swim up to five kilometres during a game. Passing, dribbling and shooting technique is just as crucial, as is the strength to battle for the ball, with grabbing, holding and kicking not uncommon in a sport where 85 per cent of the body is submerged. The sport was included in the 1900 Games, with women's waterpolo introduced in 2000. There are 12 teams in the men's competition and eight in the women's. Synchronised swimming, an exhibition sport from 1948 to 1968, made its full debut at Los Angeles in 1984. It is open only to women, who perform technical and free routines to music in duet and team events. Breath control is key as strenuous manoeuvres are performed underwater and upside down. Underwater speakers let the swimmers hear the music and achieve the split-second timing critical to the event.